This consists in cutting a shoot back to three or four buds from its base; e.g. in a bush rose to an outward growing bud and at a point which is usually 5-6 in. from the ground. In this form of pruning, a shoot is cut back by about half its previous year’s growth. Here there is very little cutting away; usually the dead flowers or hips are removed by cutting at the first or second eye below the flower-bearing stalk. These should be hard pruned in the first spring after they have been planted, i.e. cut back to the third or fourth outward-growing bud from their base, to ensure that as many new shoots as possible spring from low down on the bush and that it grows into a well-balanced, compact shape. If this is not done, the bush soon becomes leggy and unsightly. 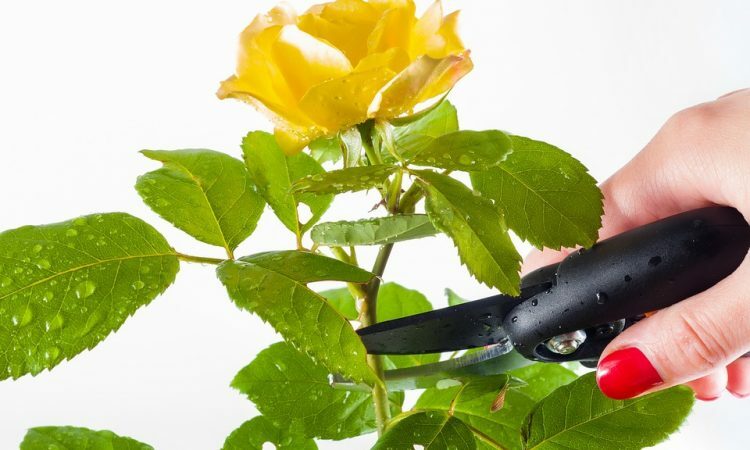 It is the modern practice to prune hybrid tea roses moderately, i.e. to cut their shoots back by half their previous year’s growth. However, because of their great vigor, many soon become very tall and rather unwieldy for today’s small gardens. There are two ways in which this can be largely overcome. Moderate prune all shoots except two. These are hard pruned, i.e. cut back to two or three buds from the base of the bush. This procedure can be repeated in successive years. Hard prune the bush every three years. This method seems to keep its size under control without any serious lowering of its flowering-power . The second method is the better. Secondary shoots which have developed below the clusters should be cut back to three or four eyes from the main stem. (1) All one-year-old wood, that emanates low down on the bush, should be lightly pruned by cutting out the dead flower heads. (2) All the remaining shoots are moderately pruned, i.e. they are cut back to about half their length. Standard hybrid tea and floribunda roses are pruned in the same way as their dwarf counterparts. The object should be to preserve always an open center to the head. With hybrid tea standards, moderate pruning is usually the best. The most effective of these are Group 1 Ramblers , that have been budded at the top of tall stems of the particular stock. All the old wood, which has flowered, is cut out near to their base as soon as the blooms are spent in the summer. The current year’s growth is allowed to remain and flower the following season. After all dead, diseased, weak or inward-growing shoots have been removed, cut away clusters of dead flowers in late winter or early spring. Apart from removing the dead blooms regularly, which enhances their power to repeat-flower, all that shrub and species roses require is to have cut away surplus growth to keep them in shape and their size under control. After some years, however, they tend to become bare at the base. This can be remedied by cutting one or two of the older shoots back to an outward-growing bud about 9 in. from the base. If this is done annually for two or three years, the roses will be completely rejuvenated. These roses, in the main, need to have diseased or dead wood and spent blooms only cut away, apart from any necessary thinning out and trimming to shape and size. Pruning is best done with a pair of nail scissors. GROUP 1 RAMBLERS These climbing roses pro­duce nearly all their new shoots from the base. The group includes ‘Dorothy Perkins’, Excelsa’, ‘Francois Juranville’ and ‘Sander’s White Rambler’. All ramblers flower on the previous season’s growth and it is necessary to prune them soon after they finish flowering in the summer. 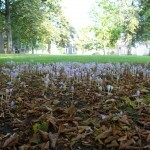 which will bloom in the follow­ing summer . Pruning Group 1 ramblers. All old shoots (marked x) that have flowered during the current summer are pruned to an outward growing bud near the base of the plant. The new shoots (marked y) that remain, are tied in at the same time. GROUP 2 RAMBLERS These mainly produce their new shoots at points on the old wood higher up the tree. Examples are the old ramblers Albéric Barbier’, Albertine’, `American Pillar’, ‘Chaplin’s Pink Climber’, Easlea’s Golden Rambler’, ‘Emily Gray’ and ‘New Dawn’. The old wood is cut back to a point where a robust, young, green shoot emanates. This leading shoot is left and tied in ready for next year’s flowering. All the shorter laterals are pruned back to a bud, 2 or 3 in. from where they originate. Old wood that has no new leading shoot should be removed to prevent overcrowding. This type of rambler tends to become bare at the base. 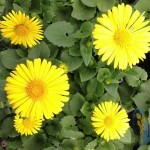 This can be re­medied by cutting one or two stems down to a bud 1 ft. from the ground. CLIMBERS This group contains the more vigorous climbing sports of the hybrid teas and floribundas, the stronger growing large flowering climbers, such as ‘Casino’ and ‘Coral Dawn’, and the climber ‘Mermaid’. wood should be cut away and the laterals that flowered last year reduced to the third eye from their points of origin. Most of these roses, especially the climbing sports should not be pruned in their first year, because the latter are liable to revert to their dwarf stature. GROUP 4 CLIMBERS Included in this category are the climbing sports of ‘Iceberg’, ‘Korona’ and ‘President Herbert Hoover’, the large flowering climbers, which are typified by `Elegance’, ‘Golden Showers’, ‘Handel’, `Rosy Mantle’, ‘Schoolgirl’ and ‘White Cockade’, the Kordesii climbers or pillar roses, `Ritter von Barmstede’ and ‘Dortmund’ and the Bourbon climber Zéphirine Drouhin’. This group needs little attention other than a general clearing out of unwanted growth and pruning to control shape and size. During their first year remove only any dried out ends of stems, together with any dead wood and very twiggy shoots.